Zero: We want to make that! 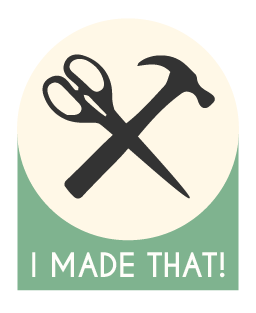 – I Made That! Zero: We want to make that! We’re both creative types, who rarely take the time to create. Often, we’ll look at things and say to each other “I could make that”, but it’s much easier to quaff red wine on the couch in stretchy pants. The last couple of years has been a whirlwind of study, organising a freakin-fabulous wedding, new jobs, setting up a house together and more study! These sort of life changing events do not lend themselves to spare time. While we are not sure how much spare time we will realistically have in 2017, we have decided that this year we will prioritise making and mending in our lives. We would both like to pursue a simpler life. A life that that is less reliant on the machine that we find ourselves a part of and a life that considers how we engage with our world. Increasingly, we are becoming aware of how our daily choices contribute to the deterioration of our planet. An aspect of this undertaking is to educate ourselves on how our lifestyle affects others and to hopefully start conversations within our circles around seeking change. Somewhat selfishly, there is a particular kind of satisfaction that comes with making or mending something with your own hands. Being able to say to a friend “I made that” after they compliment your creation is rewarding (albeit smug). In an era where we are encouraged to outsource and seek convenience we want to know how to fix a chair when the zompocalypse strikes. Our aim is to complete 52 make or mend projects through the year. As a couple, we will share the load between us and write about our experience. Ideally, our posts will be on a weekly basis, but sometimes watching another episode of 30 Rock is much more appealing. This is part of a larger goal, that we sustainably live outside the machine, man! We want to ensure that we are gracious to ourselves and each other avoiding making our projects a chore that we have to tick off a list. So, why are we writing about this? 80% accountability, 20% ego. It also means we are likely to spend less time watching Pointless television. So join us, follow our projects and please, if there is anything you think we should make, let us know! great idea and best wishes for a year of great making. We are all in the mending mode here as the things we made once are falling apart now! Also I discovered Pointless on daytime TV just the other day, and it was a fantastic way to lose half an hour of my time. Making something probably would have been better though.. I first discovered Pointless when I was travelling in the UK. It’s one of those quirky British shows that wouldn’t work if another country tried to produce its own version. Forty-One: I Can Fix That! 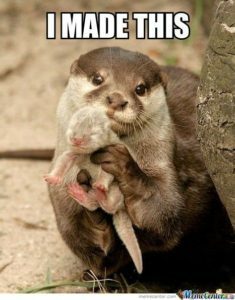 – I Made That! © 2019 I Made That!